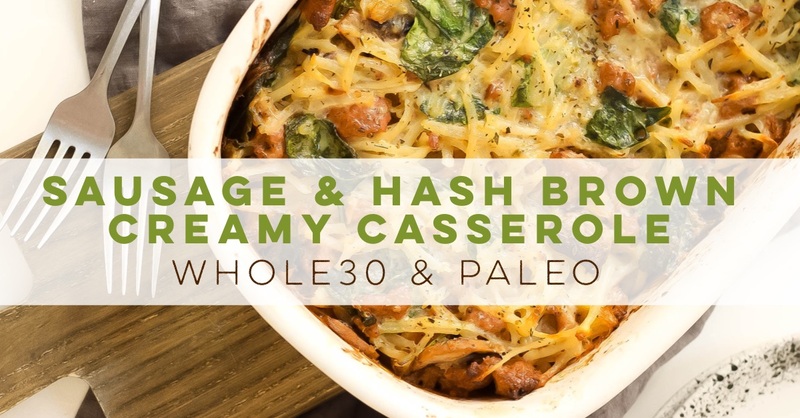 This creamy Whole30 casserole is the perfect easy and family friendly dinner. 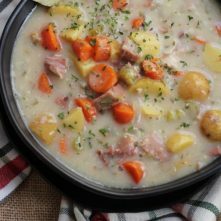 It’s with sausage and potatoes in under an hour and is a creamy, comforting Paleo or Whole30 recipe. It would be great for meal prep, and I think the leftovers are almost more delicious! My midwest, Minnesotan youth was filled with all types of classic casseroles. In Minnesota we call a casserole a “hot dish”, which I’ve been told isn’t the norm in most parts of the country. Hot dishes, or, you know, casseroles, were a staple at every family gathering. 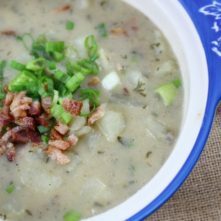 That’s probably why I think of these foods as comfort foods now – hearty, and ate around a table with my favorite people. Now it kind of makes me laugh because now that I make casseroles for myself, like this Whole30 casserole I know how easy they are. I’ve realized that that’s probably the real reason they’re always around or why my mom made them when she wanted to just throw things in one pan and be done with it. 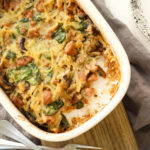 This creamy sausage and hash brown Paleo and Whole30 casserole is ALMOST a one pan meal, but you will need a skillet for the creamy sauce and sausage. It’s worth the extra dish, I promise! 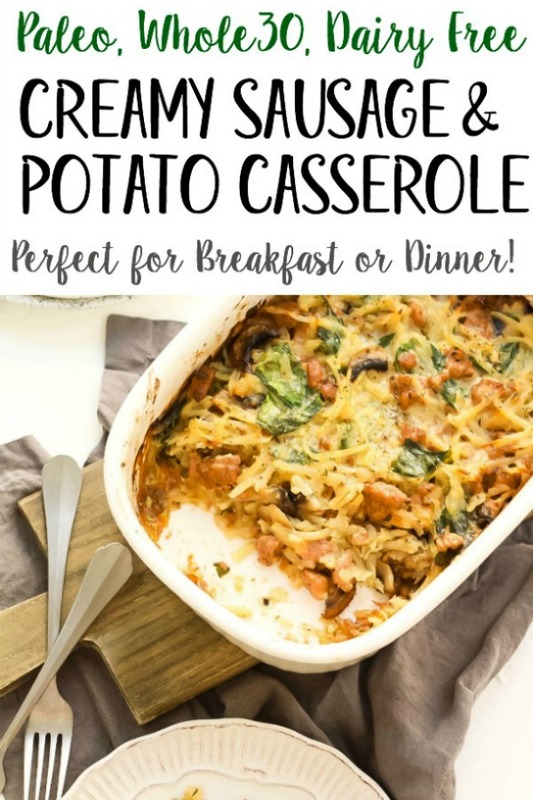 I love this casserole so much I’ve made it specifically for breakfast too. I tell myself it’s like a hash brown sausage and gravy casserole when it’s before 9 a.m. The potatoes I used for the paleo casserole came from a bag of compliant hash browns. You can find these in many stores, including Walmart! If going from frozen, you’ll want to let them thaw prior to baking. I used canned coconut cream and a Califia Farms almond milk. Any Paleo substitution would work for the milk, including nutpods. You’ll need a bit of ghee for the cream sauce, broth, and some arrowroot flour to thicken the cream and the rest of the ingredients will be your normal pantry and food items! Califia, nutpods, coconut cream, ghee, broth and arrowroot can all be purchased from Amazon, or your local Whole Foods. You can also grab all of those products at a discount from Thrive Market (and get 20% off of your first 3 orders!) For more of my favorite Thrive Market budget favorites, check out my Paleo staples list, and Whole30 staples list! The Whole30 casserole recipe itself is really easy. I mean, of course it is. You’re talking to me after all. Nothing fancy or complicated. Simply brown the meat first, make the creamy sauce, combine it all in a baking dish and you’re set! I hope you enjoy this recipe as much as I do! Combine well and bring to a simmer, about 5 minutes. While the sauce is heating, add hash browns, spinach, mushrooms to the bowl with the crumbed sausage and mix well. Place the potato and sausage mixture into the casserole dish. If you want a thicker cream sauce, or sauce is too thin, add an additional 1/2 tablespoon arrowroot flour and slowly whisk in. Holy moly this is good!! Reheats so well for my lunches! Thank you! I CANT BELIEVE how good this is! Do you think this would work with compliant sausage links?. I haven’t found the bulk sausage yet. Would like to make it NOW! YUM. Hi there! Yes, I think it would be great with sausage links! Let me know how it turns out! 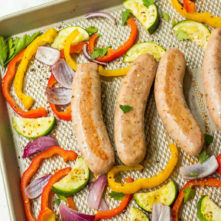 PS – check a local butcher, I’m often able to find ground sausage without anything crazy added to it 🙂 Pederson’s (ordered through the Simple Grocer) also carries a Whole30 Approved one! Holy crap! This casserole is DELICIOUS! I was super hesitant because I’m not really a fan of coconut milk/cream in recipes but I can’t even taste it! I just wish mine looked as pretty as yours ???? Thank you!! I agree about the coconut milk – I actually don’t even like the taste of coconut so every time I use it I’m sure to cover the taste with spices 🙂 so happy you enjoyed it! This looks delicious and I can’t wait to make it! I only have canned coconut milk though, no broth or almond milk (although I could make almond milk). Since canned coconut milk is runnier than the cream, could I just use that and skip the other liquids, or what would you suggest? Thanks! Hey there! Yes, you could try that! It might be a bit more “coconut-y” tasting, being the broth and almond milk serves to make the “gravy”, but if you’re okay with that, I think it would still be good! Make sure you buy unsweetened coconut cream. The Goya brand used we are realizing is used to make Pina Coladas. We will have to try again. ???????????? Same thing happened to me… just grabbed the can that said Cream of Coconut and bought it. So disappointed. Can I use canned coconut milk instead and eliminate the almond milk so it’s not too watery? I was really looking forward to making this tonight. SO glad I looked a the label before I used it! Sure! You can try it!! Can you use frozen hash browns with this recipe? How do you think this dish would do if I wanted to make this meal to freeze it for later? Freeze before cooking or afterwards? Baby is due in October so I like to stock up with easy thaw/ reheat or cook meals. This one sounds delish! Hey Christina, how did freezing and cooking from frozen work out for you? It looked too good to freeze so we ended up baking & eating it all, hahaha. It was delish. I plan on trying to freeze it in the future- I will let you know how it goes! How long will it be good for leftovers? like 3 or 4 days? Did you use russets or a more moist potato (red, white) for the hash browns? I am allergic to coconut, and all treenuts what could I use as substitutes? Hi there! Sorry for the late reply here, I don’t know how I missed your comment! If you’re not doing a Whole30/Paleo, I’d use heavy cream. If you are, I don’t think there would be a nut free substitution that I’d be confident in recommending that would still replicate the milk used here. Sorry!! Hi Bailey – firstly – congratulations to you for finding the “real you” & becoming so healthy. Fantastic job. You look awesome. I had an abundance of potatoes & was scrolling through Pinterest for an interesting way in which to use them. I like making casseroles & yours caught my eye. I don’t follow the Whole30/Paleo diet, so made some substitutions. ie: I used a can of Carnation Brand fat free evaporated milk in place of the coconut milk. I didn’t use frozen hash browns – grated my own & squeezed out the liquid. I used sausages & cut them into thin slices, then browned them. And I used regular flour to thicken the sauce. The casserole was delicious – I like your choice of seasonings. I hope that you don’t mind my messing with your original recipe. I would absolutely make this again. Thank you for sharing it. This was absolutely delish!!! My family could not believe it was a whole 30 meal!! I love when that happens!!! Thank you for an awesome recipe!!! Oh thank you so much!! I’m so happy to hear that! This is definitely a keeper. For me, it was a little on the Sweetside. Next time I make it I’m going to use only the almond milk and no coconut cream. The texture was wonderful and the spices added just the right amount of super flavor. That sounds like a great substitution! If you use additional almond milk to replace the cream, you could probably use a bit less almond milk being it’s thinner than the cream. I just don’t want it to get too liquidy for you 🙂 I’m glad to hear overall you enjoyed it!! I wasn’t sure you could make a hot dish without cheese or cream of something soup, but you nailed it! The only minus is I was hoping to have leftovers! So yummy! I’m happy to help, and so glad it was a hit! Thank you for letting me know!! I have made this once and it was delicious. I ate it with a side of salsa to spice it up a little. Next time I may add a little cayenne pepper and also some chopped red bell pepper to give it a little more pep. I can’t always find canned coconut cream. Can I use canned coconut milk instead? Did I miss something? You are using ghee but it says it’s a dairy free recipe. Is there a dairy free ghee? Hi Melissa! Great question! Ghee is a type of clarified butter – butter that has been heated in order to separate and then remove milk solids from the milk fat. The fat remaining, is ghee. Since ghee is the result once the milk solids have been removed, and the milk solids are what contains lactose, casein and antigenic proteins, it is dairy free! The remaining fat that is left is just a pure cooking fat then. If you were thinking otherwise because on ghee ingredient labels they say something to the like of “Certified Organic Butter (Milk)” or “Milk Fat”, that’s because of two reasons. The first being that the USDA hasn’t come up with a better way besides “milk” to classify what ingredient IS ghee, without using the word “ghee” as the only ingredient. Ghee is technically the end RESULT of a cooking process which removes the lactose milk, not an ingredient in the cooking process. And, this labeling law hasn’t been updated or looked into being updated since 1993. Secondly, the the USDA requires “milk” to be on the ingredient list for any END product originally obtained FROM raw dairy, even if the milkfat has been removed in that end product. This is so consumers know what type of a product/animal it’s from, and prevent potentially harming those who have severe beef allergies, or the immune response to all beef products known as Alpha-gal. You’ve freaking outdone yourself. The only change I made was not using almond milk because I didn’t have any that was unflavored. This tastes like the best unhealthy biscuits and gravy and I can’t believe it is paleo. It’s comfort in a bowl. I could eat this whole pan. THANK YOU. 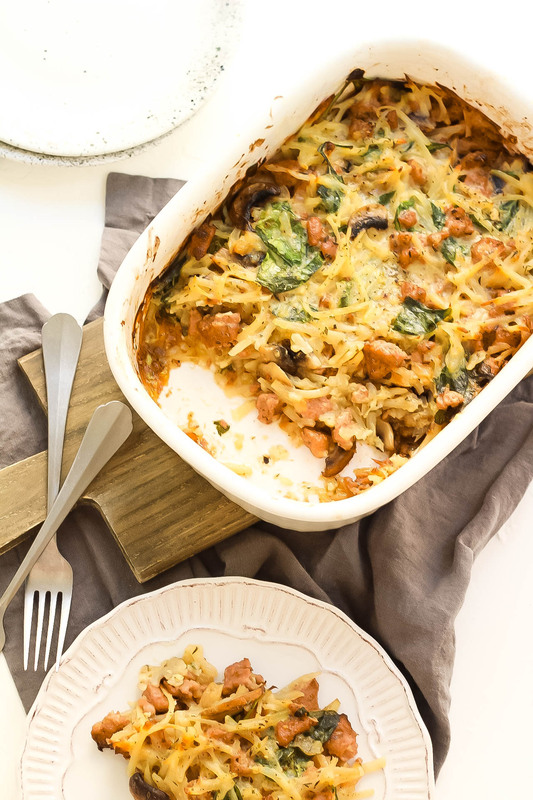 Thank you for sharing the most delicious GF / DF breakfast casserole ever!! And easy to make. Note: I used half the seasonings called for because my turkey sausage & chicken broth was already heavily seasoned. Loved this recipe, it was even better on the second day! It was so warm and comforting! I’m SO happy you loved it! Thank you, Amanda!! This is my first month trying whole30 and my sister recommended this dish. I love love love this dish! It isn’t super complicated like some recipes I have found when trying to come up with whole30 meals! Just curious if you have any estimate of the calorie count so I can log it in Fitbit. It was absolutely delicious and just as good as leftovers! Hey there! I’m slowly working on adding macros to the recipes but it’s a slow manual process 🙂 You can use My Fitness Pal or another app you prefer! Sorry about that! I am debating freezing this or cooking tonight! 🙂 Has anyone ever frozen it and had success?! Yooooooo! This is da-bomb-digity!!! I resisted the temptation to add in cheese or sour cream as I went. Deliberately choosing to follow the recipe as is and give it a fighting chance. And DANG this is delicious!! Awesome job! ???? Ah! Thank you SO much!! I’m so happy you liked it! I am obsessed with your recipes, this particular one looked so delicious, I attempted to try it! Not sure what I did but I completely botched the sauce! 🙁 It was so thin & I just went with it using the 2.5 tablespoons of tapioca flour and I definitely should have thickened it more. It was so runny I had to ditch the whole thing! How can I fix this? Just add .5 tbsp until it is a good thickness, I thought the 2.5 had made it thicker, but it wasn’t thick enough & didn’t know if 2.5 was max? It smelled so yummy it broke my heart to throw it away! HELP ME, so I can attempt again and be successful! Hey! How long did you let it simmer while whisking for it to thicken? Sometimes it just takes a bit to thicken up. But my second guess is that by chance you used coconut milk instead of cream? If that’s the case, it would have been much thinner and would have required extra thickener to thicken. So sorry you had troubles!! Would you consider using spaghetti squash instead of potatoes? You could try it, but I can’t promise it will turn out. Spaghetti squash has really high water content and that excess moisture is released when cooked, and I think would really impact how creamy and thick the casserole is. If you try it, let me know! This was so Unbelievable. I doubled it to make more breakfasts and dinners. Perfect for company too. Thank you! Looove this!! Thank you so much! Bailey, this is incredible! You’re a genius! For anyone who can’t find coconut cream, I made the following alterations to the receipe and it was AHMAZING!! Heat it up for a few minutes and pour over mixture in casserole dish. I didn’t have the flour or the coconut cream and cooked it for about 55 minutes and it wasn’t watery and tasted delicious. stirred the dish half way during cooking so the potatoes didn’t get dry. Love this!! I’m so glad you both enjoyed it 😉 Thank you, Erika!! I made this two weeks ago for the first time, for my breakfast as part of my January Whole30. It is an awesome option, and I am making it for the third time today, with a mixed of shredded potatoes and sweet potatoes. I highly recommend this recipe – it has become a staple in my meal planning. Oh I love the sweet potato idea too!! Sounds awesome! Thank you so much for making it, and letting me know you enjoy 🙂 You’re the best!! “The potatoes I used for the paleo casserole came from a bag of compliant hash browns.” What brands of hash browns are Whole 30 compliant? Thanks. The Whole30 compliant brands I know of are – Mr. Dell’s brand is at Walmart and Super Targets. Sprouts has a brand called Cascadian Farms. Fresh Thyme has their own brand under the fresh thyme logo. And Aldi has a brand called Season’s Choice. This has become a staple for my lunch, whether on a Whole30 round of not! Have also made it with shredded sweet potatoes, which is a great alternative. I highly recommend this recipe! Meal prepped this for a week’s worth of breakfasts — so much more comforting and cozy than a typical breakfast egg casserole. Can’t wait to make again & again! ps. I couldn’t find a compliant ground sausage, so I ended up just buying plain ground pork and adding: salt, pepper, crushed fennel, and red pepper flakes. Worked perfectly! Awesome! That’s about the spice mix I use to make my own sausage too 🙂 Thank you so much for letting me know you enjoyed it! Do you use regular hash brown potatoes or plantains? This was seriously the best casserole I’ve ever had!! My husband who isn’t paleo even loved it and it was so nice not having to make a special meal for myself. I’m definitely making this again!! Thank you!!! !